I Got Totally Bogdanoviched By Will Forte With PAPER MOON and WHAT'S UP DOC? "You still owe me $200." I had the good fortune to attend a preview screening of Alexander Payne's latest film Nebraska with star Will Forte in attendance. He was a really good sport through a typically annoying Q&A full of people who alternatingly knew far too much and far too little about filmmaking. (The only thing more frustrating than hearing someone ask an actor something dumb like, "Where did you get the idea for the story?" is hearing some film major asking asinine technical questions like, "What did you shoot on?") But after it was all over I made my way to the front of the auditorium and, after taking approximately half a dozen pictures of Forte posing with other people, I asked him for a few recommendations. Forte insisted that I watch some Peter Bogdanovich movies and suggested What's Up Doc? and Paper Moon. 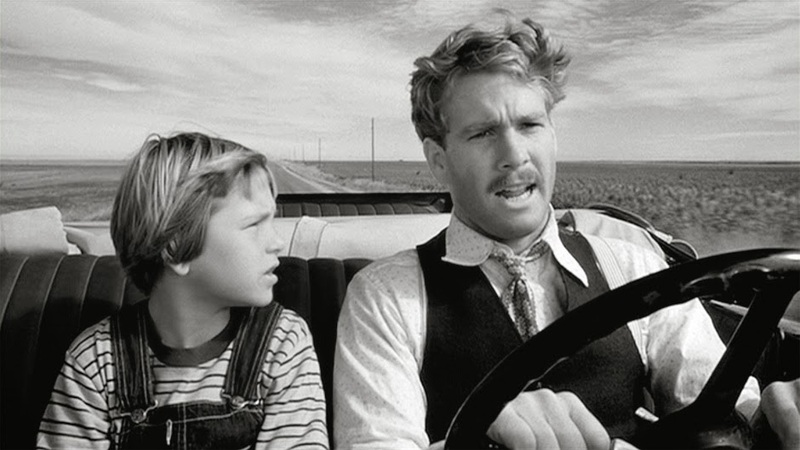 The only thing I knew about Paper Moon in advance was that it starred Ryan O'Neal and his daughter Tatum and that she had won a Best Supporting Actress Oscar for her work, making the ten year old the youngest to ever do so. I'd heard that some L.A. press screenings of Nebraska had actually been paired with Paper Moon, which I'm assuming is at least partially why Forte recommended it. I'd love to watch the two films together, as they have a kind of a ying and yang quality. Both are black and white films following a sort of broken father/child pair on respective road trips through the dilapidated American midwest and each involve moneymaking scams. But while Bruce Dern and Will Forte are the victims (sort of), the O'Neals get to play the grifters, blowing from town to town posing as Bible salesmen, bootleggers and whatever else might grab them a quick buck. I love me a good con man and Ryan O'Neal makes a fabulous one, bringing just the right mix of charm and smarm. He's not exactly what you'd call fast-talking, but he just instantly puts people at ease and wins their trust in a matter of seconds. It reminds me of my friend Warren, who clearly missed his calling as a scam artist. Tatum is great as his firebrand maybe-daughter, the perfect example of an old soul trapped in a child's body. Of course they have great chemistry together and I'm a big fan of actors working with their real life children; Jaden Smith brings out the best in his father in The Pursuit Of Happyness and I suspect that the same would have been true of After Earth if they had actually been together on screen for more than the first 20 minutes. Alvin Sargent's script is equal parts clever and heartfelt, stringing you along from one entertaining ruse to the next and then taking your knees out with a few well timed moments of touching honesty. But it's Bogdanovich's beautiful visuals of Depression-era small towns and lonely roads that really elevate the film into something all the more substantial. The visual influence on Payne's Nebraska is impossible to miss. "There's nothing to see really. We're inside a Chinese dragon." I was a little wary of What's Up Doc? when I saw Barbra Streisand on the cover, as I've always found her to be a little grating. Turns out I needn't have worried, as she makes for a great smooth talking sexpot (I know, I was surprised too.) who bullshits her way into the life of Howard Bannister (Ryan O'Neal), a nerdy and socially inept musicologist who's vying for a sizable grant to fund his study of prehistoric music in rocks. It's basically a mistaken identity/switcheroo comedy; the conflict arises from the changing hands of four identical suitcases that contain, among other things, a set of top secret government documents and a collection of priceless jewels as well as Howard's musical stones, along with the added wrinkle of Streisand posing as an infinitely more charming version of Howard's fiance Eunice, played with gusto by an incredible Madeline Kahn in her big screen debut. Streisand strays pretty far from her musically-driven persona here, even if there is a random song thrown in halfway through, but it was Ryan O'Neal who really impressed me. Howard is a stilted and awkward character, easily flustered and so absentminded that he can't even keep track of what he's holding in his hands at any given moment. It's not the kind of role I would've associated with O'Neal, certainly not after seeing him in Paper Moon. I'm much more familiar with his later work from within my lifetime, where he's usually riffing on the kind of sleazy/shady businessman he assayed so well in that black and white affair. But Doc actually came two years earlier, following the success of Love Story which O'Neal directly skewers with the film's last line. (It's cheeky and cute and probably plays a lot better now than in 1972.). The whole thing is brimming with a completely bonkers energy that's downright infectious and it's obvious that everyone in the cast is really going for it, willing to leap off a cliff for a laugh and trusting that Bogdanovich will be there to catch them. It seemed silly to me that I'd never seen a Bogdanovich movie before, so I checked his filmography and discovered that he was actually responsible for the film adaptation of Noises Off, one of my absolute favorite plays and one that I was lucky enough to be involved with in high school. That show, about the backstage/onstage shenanigans of a theater company putting on a British farce, utilizes a lot of physical comedy involving the opening and closing of doors and several revolving plates of sardines. While I was watching Doc, there was an old school comedy vibe to the thing that I couldn't quite place and as soon as I saw that old favorite listed on IMDb, I immediately understood why I'd loved this 70's romp. Call it old fashioned if you like, but What's Up Doc? exemplifies a marvelous style of humor that you simply don't see anymore. I can't tell you why, but somehow it seems that physical comedy has devolved into little more than guys getting hit in the balls and while I like a well timed nutshot, there's so much more that's fallen by the wayside over the years. I do not approve. I now officially owe one to Will Forte for foisting Bogdanovich on me. Besides, you've gotta love any filmmaker who insists on continually casting Higgins from Magnum P.I. I'm running out of time before my year is out, but at the very least I need to get around to The Last Picture Show.